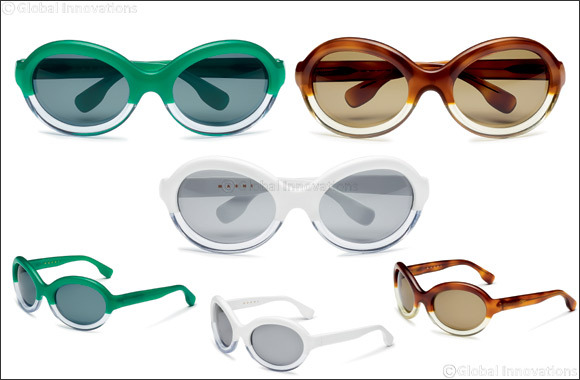 June 6, 2018: Celebrating elegance and individuality with an avant-garde aesthetic, Marni's inventive spirit and bold experimentation set the tone for the new “POP” sunglasses, first presented on the Spring/Summer 2018 runway. The vintage-inspired design is characterized by an innovative structure that symbolizes the brand's unique art of layering, with two sections of acetate brought together to juxtapose colors and lines, bestowing a dynamic and vibrant edge to the feminine style. The unconventional twist of this design is exquisitely expressed by the combination of the horizontal cut of the plastic textures, blending solid and transparent tones with the rounded proportions of the frame. An eclectic contrast that fuses Marni's playful elegance with the modern women's desire for fashionable yet versatile accessories. The sunglasses are further embellished with the golden “Marni” logo laser engraved inside the right temple. Available in Tortoise/Crystal Yellow, White/Crystal and Green/Crystal. Marni eyewear is produced under license by Marchon Eyewear, Inc., one of the world's largest manufacturers and distributors of quality eyewear and sunwear.